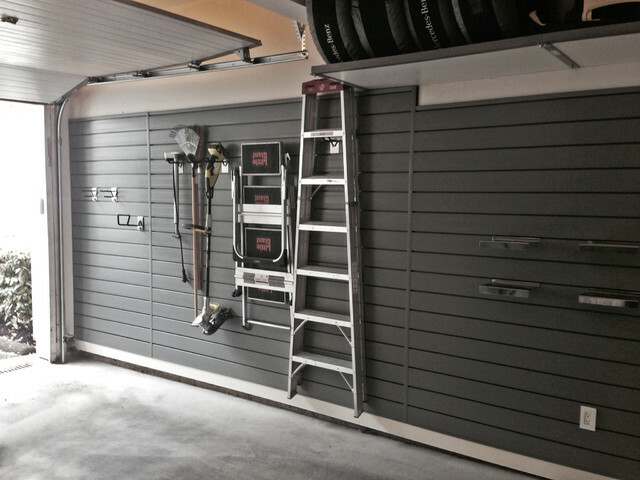 A recently finished Garage by Garage Guru. This space features a grey slat wall - easy to re configure when your storage needs change and customizable with a large number of accessories. The top right showcases heavy-duty Monkey Bars shelving - perfect tire storage for your winter wheels. Idea: Panel the wall adjacent to the garage door. could remodel walls to look something like this.